These were supposed to be gumdrops, but anyone who follows my Edible Tapestry Facebook page knows that once I got down to it, my gumdrop project was not going as planned. They turned out much different than I’d anticipated…and BETTER! I read lots of gumdrop recipes and finally decided on one that was made from applesauce. I was about to start cooking when I thought, What am I doing?! Gumdrops do NOT have applesauce in them. So I ditched the recipe and gathered my ingredients. I decided to combine a few of the methods I had seen used while I was researching, but to measure my own ingredients as I went along. 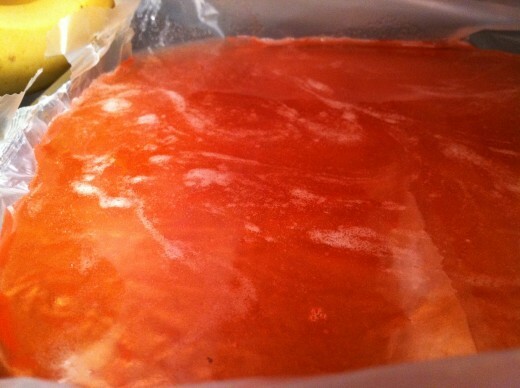 I boiled my simple syrup and combined it with my Jellos and gelatin, then let it set overnight. Nothing happened. I had a bunch of sticky goo with the consistency of grape jelly. It was easier to leave it in the fridge than to deal with the sheets of plastic puddled with sludge, so I put off tossing them for a few hours while I worked on other projects. When I finally got around to pulling them out, I knew I couldn’t throw them away. Such a waste. So I decided to put them in the dehydrator to see what would happen. The temperature was up all the way, and I didn’t realize. I didn’t even know the silly thing had a temperature gauge. So, after 24 hours when I checked my sheets of jelly they were still soft. I decided at that point to just throw them away. The dehydrator was really pretty warm, so I turned it off. When I came back to dump my jelly sheets, they were cooled and firm. I almost jumped up and down. They did not end up being gumdrops. 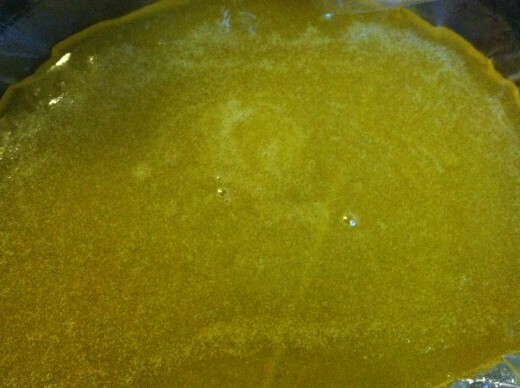 I will follow a tried and true recipe for gumdrops the next time I attempt to make them. These, however, are very similar to those jelly fruit slices you can buy in specialty candy shops. I LOVE those fruit jellies, so was very happy with the end result. Now, if only I could figure out how to make them in half moons with that creamy “rind”. My intention all along was to cut the gumdrops out with a tiny leaf cookie cutter I have, but the outer layers were so rubbery that I couldn’t get the cutter to go through. 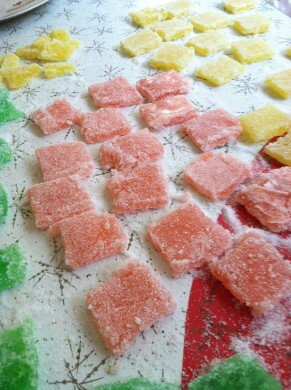 I ended up slicing them into squares and rolling the squares in lots and lots of granulated sugar. 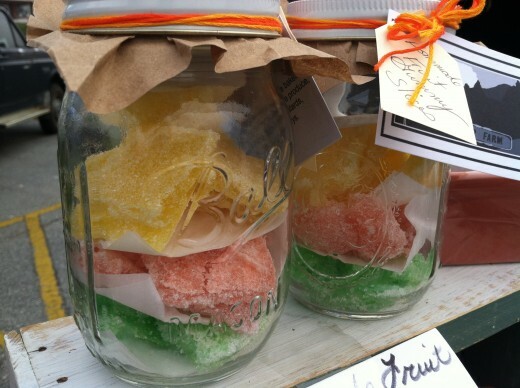 Here is my process for making fruit jellies. 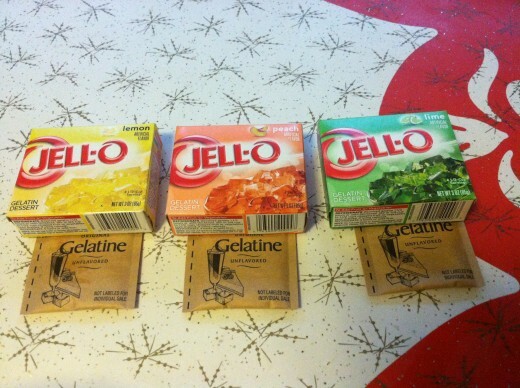 In 3 separate heat proof dishes, whisk together one package of Jello and one envelope of gelatin. Combine the 4 c. sugar and the water in a med. saucepan. Heat just until boiling and reduce heat to a simmer. Simmer 5 minutes to make a simple syrup. 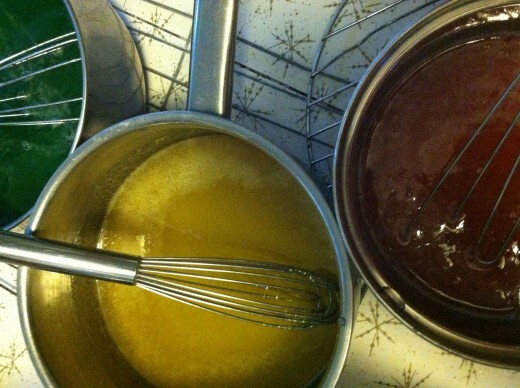 Pour 1 1/3 c. simple syrup into each container of gelatin mixture. 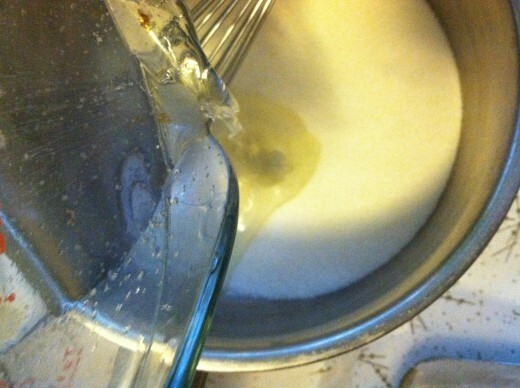 Stir well to allow the gelatin granules to dissolve. 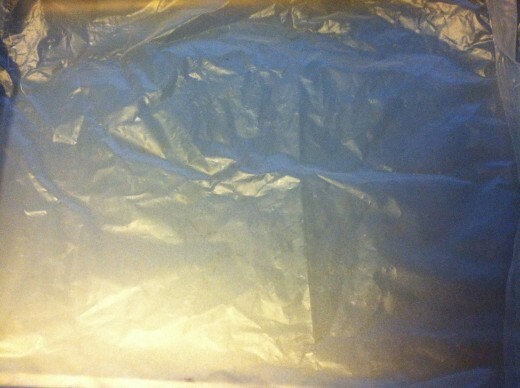 Pour into plastic lined 9X9 sheet pans or baking dishes. Transfer the sheets to a dehydrator and dry overnight. Mine was set to 145F. I think that was too high. You can adjust the temp. and time to your dehydrator. 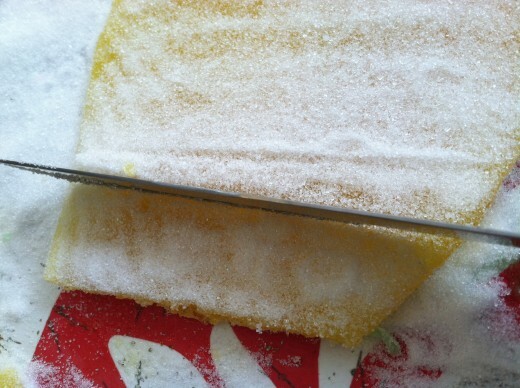 Sprinkle sugar over a flat surface. 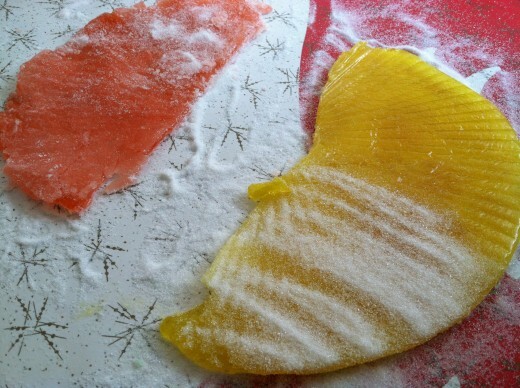 Flip the sheets of jelly face down onto the sugar and peel the plastic off the back. Generously sprinkle the surface with sugar. If your jelly is not as rubbery as mine ended up, you may be able to cut the pieces out with shaped cutters. If not, generously sugar a knife and cut the sheets into equal squares. Roll the squares in sugar. 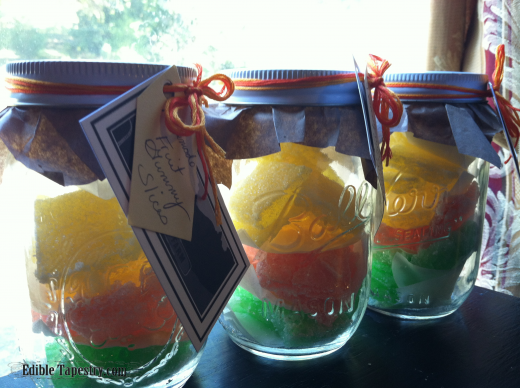 I lined the bottom of mason jars with parchment paper, and then layered the different flavors in with sheets of paper in between, to make treat jars for gift giving. I ended up with enough to fill 4 pint sized mason jars.